Morning! I took a few deliveries yesterday (fortunately I was in most of the day, thus avoiding that awful trip to the Post Office depot to stand in a queue with screaming babies and stinky dogs and angry, frustrated customers only to find the Royal Mail have lost a box of irreplacable first generation Cypripedium hybrids but don't seem that bothered about it and refer you to the world's most idiotically designed website with Gertrude or Agnes or whatever their virtual customer "assistant" (basically a bad search engine) is called. I had been there on Monday at 7am for two packages; one some goodies from Edrom nurseries, the other my monthly supply of contact lenses which, oddly, has fitted (fit?) through my letter slot every month for the last six years but on Friday apparently didn't, despite being exactly the same size as usual. And I'm pretty sure the letter box hasn't shrunk. Bloody idiots, as a social democrat I'm not often in favour of privatisation but the sooner we're rid of that idle bunch and their Hannibal Lecter people skills the better. Lilium candidum. Check my home-made woodland soil! It's just as well I had the Lilium Candidum and Anemone nemorosa viridiflora from Edrom to put a smile on my face (now that I could see them in 20/20). The Lily is already well into growth with luscious green foliage about 10cm tall. It doesn't look like your typical example of the genus, ie there doesn't seem to be a single stem, more a collection of leaves. Perhaps it's just too young and will change as the weeks or, disappointingly, years, pass. Then yesterday I got two little presents, one of which I hadn't been sure I'd ever see. On eBay I won five Gladioli and that blue Moraea villosa I'm always banging on about (there was quite a ding-ding battle for that but having seen a Google image of it I wasn't going to be beaten!) I had some concerns about the sellers, BulbsAfrica as they had no feedback and I was sending them sixty quid. But I needn't have worried: the bulbs arrived in good time with all the correct paperwork (not dug up from behind a rock in the Transvaal) and are all dormant which is as it should be with many South African plants being winter flowering (our late summer), with each species individually wrapped in a paper bag with dry vermiculite, a label and most with a few free offsets (although all but G. Carmineus are tiny (but of flowering size, I'm assured) so a seive might be required to make sure I don't miss anything! The Moraea is similarly healthy. Some instructions would have helped, the only South African plant I've grown before being an Agapanthus (who buys a WHITE version of a plant famous for being so blue? A 15-year-old me being contrary, that's who. It should still be alive but the last time I was standing next to it it was under 2ft of snow). So sometimes it pays to take a punt on something you really want, although only if you can afford to put food on the table if it goes wrong! While we're on the subject of things from South Africa going wrong, the "greenhouse", despite being fully aired as often as practical has caught H1N1 or botrytis or some sort of pathogen (my weak area and why I'd be crap on Gardeners' Quesion Time). Suffice it to say that, even though I was keeping everyting as dry as possible so they were alive but not really growing, one of my Pelargonium species seedlings, grown from a seed mix, got hairy and the leaves began to go. I removed it but by then it was rampant, leaving only the Penstemon cuttings in rude health (although the "tender" parent plants are about the healthiest things outside). 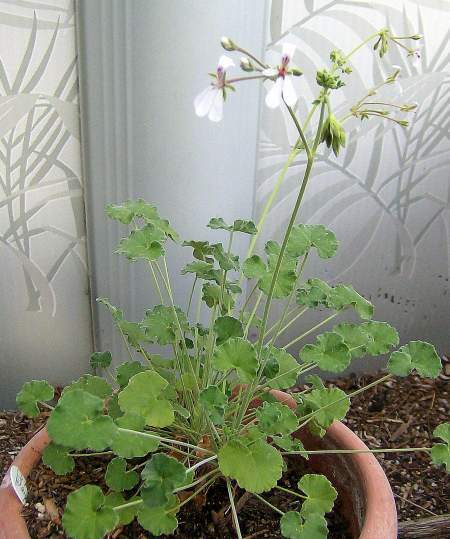 I've a larger species Pelargonium, P. dichondrifolium, which looks ok (it was a bit sad when the nurseryman sent it out so he very generously included a "Lady Plymouth" which is also doing ok. Pretty much everything else is on suicide watch and half a dozen blue Salvia cuttings that are looking less perky by the day (although I do have seedlings, it was such a stunning selection I wanted to do things asexually). Next winter I'll have to be more brutal and leave more space for the air to circulate. I've had a few more deliveries, including the puzzling Iris maackii, which I grew from pukka Chilterns seed as a child and which turned out to be identicle in every superficial way to I. pseudacorus. But this one from Westcountry nurseries, which was fairly exploding with health out of its 10cm pot, in fact the first thing I did on unwrapping it was an emergency transfer to a 20cm pot. However, the label claims it is blue flowered, as I've seen mentioned several times before. All very confusing ... I will update you in April/May. The label claims the flowers are 4 inches across, so even if my contact lenses get lost in the Royal Mail's Large Hadron Collider, I should be able to tell the difference between blue and yellow. 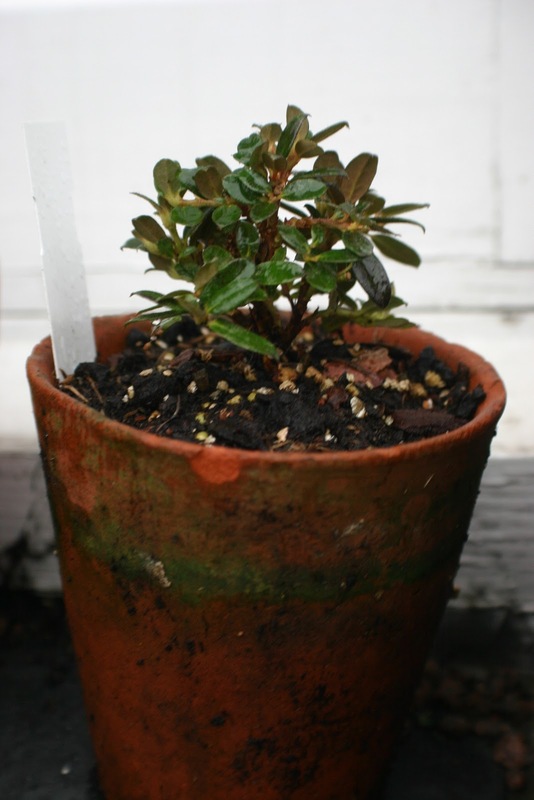 Also included was the world's smallest species of Rhododendron, keleticum, or R. calostrotum ssp. kelticum to give it its Sunday name, a tiny little thing with the kind of flowers a catalogue would describe as blue and everyone else as lilac. I have it in a dare-I-say-it vintage clay pot that was among a load I brought back from Scotland before they were thrown out (amazingly only 3 of a dozen broke - and my suitcase weighed less on the return trip, says something about my generosity or the weight of toys!). The flowers are disproportionately large (they have to be, the leaves are so wee!) making it even cooler. Now my collection is growing, it's getting harder and harder to buy Lilies as bulbs and plants, hence the pots of seeds stratifying out there. But I did get L. sargentiae as a potted bulb and something called a Bellingham hybrid which seems to be a rather gorgeous yellow-orange turk's cap with red flecks (makes a very refreshing change from black). Oddly, the hybrid Lilies are all bolting through but none of the species has made much of an appearance. There are a few green shoots if you brush a little compost out of the way but they don't seem to want to come out of hiding (mind you, neither would I in an English January). Also in the parcel were a gorgeous little red primula called maximowiczi, a relative of that black one that is just about holding on, and Iris cristata, for no real reason other than it was there. Is my life-long love affair with irises cooling? Am I having an affair with Lilies? These and other questions will be forgotten by the time of my next post as I have some seeds to deal with, including one first found in a crevice in Tibet in 2003 (so that's a sure-fire success, ahem) and then write about. Speaking of which, this has got to be the first germination of the year. Sown on the 1st, noticed it today. It's only Lupinus versicolor. 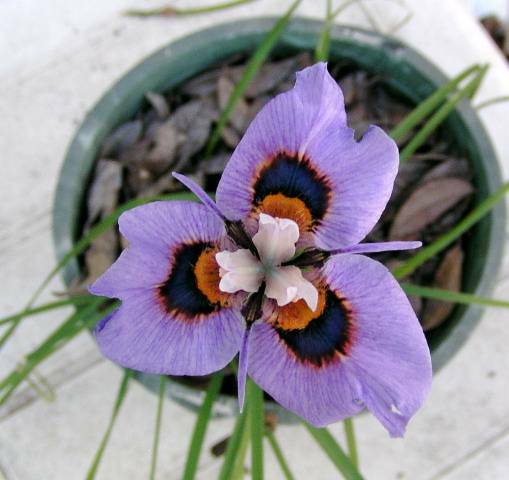 That Moraea villosa is pretty and so is the price! I think so, you are having an affair with lilies :) Can't wait for your next post!